All her adult life Margherita had struggled to find safe, accessible, affordable housing. Born with achondroplasia (dwarfism) and standing 1.2 metres tall, Margherita found even simple tasks like using the washing machine or taking food from the kitchen cupboard an everyday challenge. In 2014 her world changed overnight when she moved into a Housing Choices Australia purposebuilt, accessible home in Seddon in Melbourne’s west. Fiercely independent, it had not occurred to Margherita that she was eligible for affordable housing until a friend suggested she talk to our support agency partner Housing for the Aged. Margherita loves to entertain friends in her cosy apartment but she also feels she can get out more from a home designed to meet her needs. Despite her unstable domestic situation, Margherita has led a varied and interesting professional life including in the former Commonwealth Employment Service, in the Victorian public service and then as a diversity employment consultant. 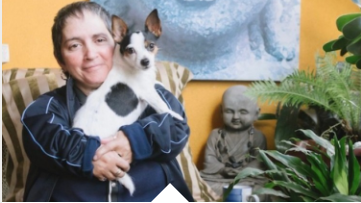 She is an accomplished amateur photographer, has competed twice and won medals in the world masters games for short statured people as a bocce player, and is a respected disability advocate in Victoria. Her small dog Missy is a loving if cheeky companion. With thanks to Margherita and Housing Choices Australia. Full (voting) membership is open to all incorporated not-for-profit community housing providers. Associate (non-voting) membership is open to individuals or organisations that support CHIA’s objectives but are not community housing providers.